Dr. Kari presenting a check to the Riverbend Down Syndrome Association. 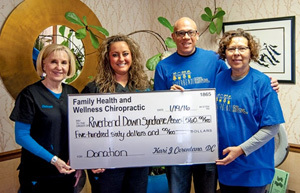 Click to read more about Dr. Kari’s fundraising promotion! At Family Health and Wellness Chiropractic, our mission is to provide unique, dedicated care to both individuals and families in Edwardsville and Litchfield who are on a quest to improve their health by utilizing effective chiropractic techniques and acupuncture. Dr. Kari understands what true health means—and it’s more than just being pain free. Achieving an overall well-being allows you to live your best life for yourself and your family. Best of all, chiropractic care and acupuncture are completely natural methods requiring no drugs or prescriptions. Wellness care puts your body in the shape it needs to be in to heal itself time and time again. Chiropractic care revolves around improving the function of a patient’s nervous system through spinal alignment. Your body has millions upon millions of nerves, and at any given moment, something as small as a sudden bend, tweak or movement can disrupt the alignment of the spine, resulting in blocked nerves. The longer this injury goes on unattended, the more wear and tear is brought upon your body. With chiropractic care, the goal is to realign a patient’s spine to correct subluxation, improving nerve signals traveling throughout. Additionally, Dr. Kari is certified in acupuncture, a therapy that helps muscles relax, relieves stress and promotes quicker healing throughout the body. Acupuncture is a fantastic way to complement the benefits of chiropractic care. We love seeing the changes that chiropractic care brings to our patients. From helping older individuals enjoy and stay active in their retirement to teaching entire families about the importance of spinal alignment, Family Health and Wellness Chiropractic offers a well-rounded approach to health for life. If you’re ready to learn more about what Dr. Kari can do for you, contact our office today.